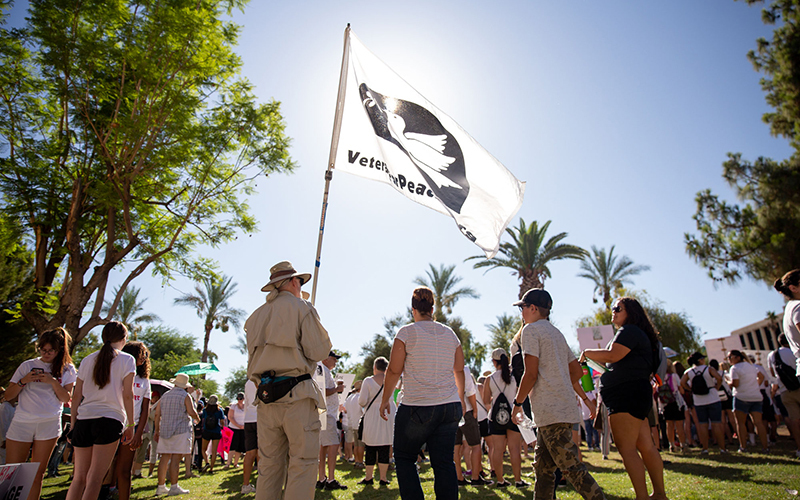 PHOENIX – The Families Belong Together movement drew thousands across the country, and hundreds across Arizona, to protest the treatment of migrant families who were separated at the Mexican border. 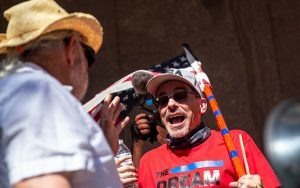 The scene at the largest protest in Arizona, outside the Capitol on Saturday morning, was peaceful, despite a small number of counterprotestors who began a Deport Families Together event on Facebook and who showed up before 8 a.m. Some of the estimated 800 protestors chanted such things as “Sí, se puede” (Yes, we can) and “Love, not hate, makes America great.” Others sat silently or used art to make their own statements. Rob McElwain stood holding a sign four times his size. For those who follow the news, the image on the sign was immediately recognizable. For those who don’t, it was provocative. To everyone, it was something to photograph. 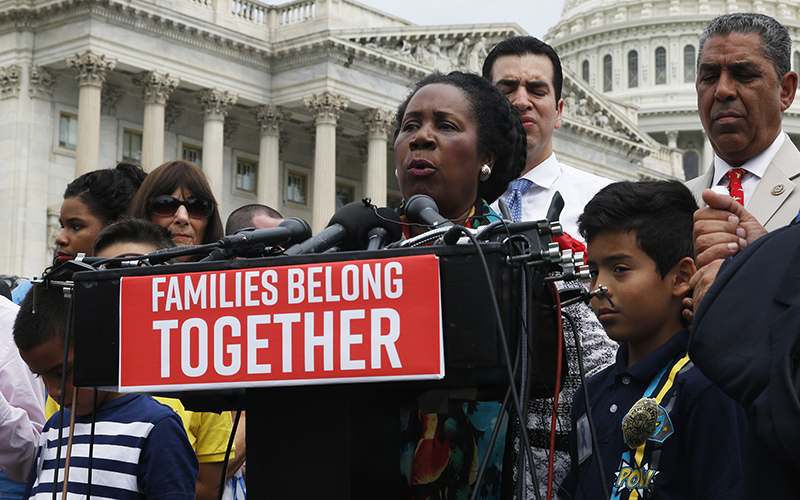 The poster held a large, red caution sign, underneath it a caricature of President Donald Trump pulling a child away from two fleeing parents. Rob Rogers, long-time editorial cartoonist at the Pittsburgh Post-Gazette, drew the original image before he was fired last month for being “too angry,” according to his op-ed in the New York Times. 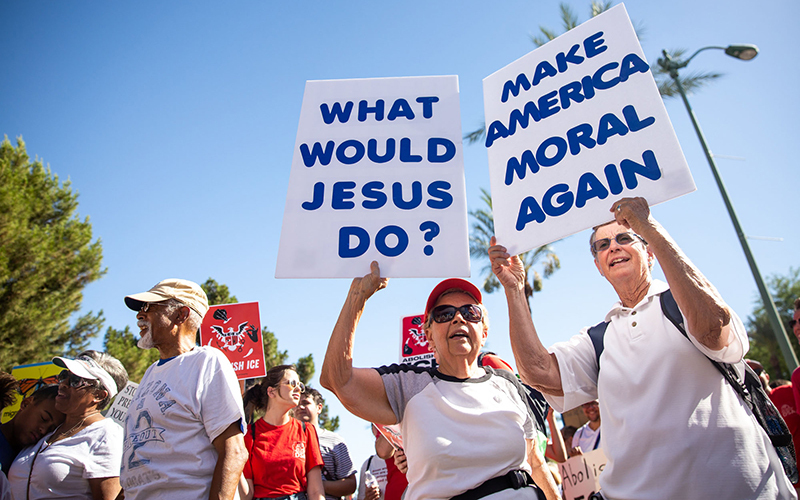 “I stand out with my signs to have pictures taken to try and get the message out there,” said McElwain, who began creating attention-grabbing posters 10 years ago while protesting former Maricopa County Sheriff Joe Arpaio. He works protests like these, or downtown corners, nearly every day. 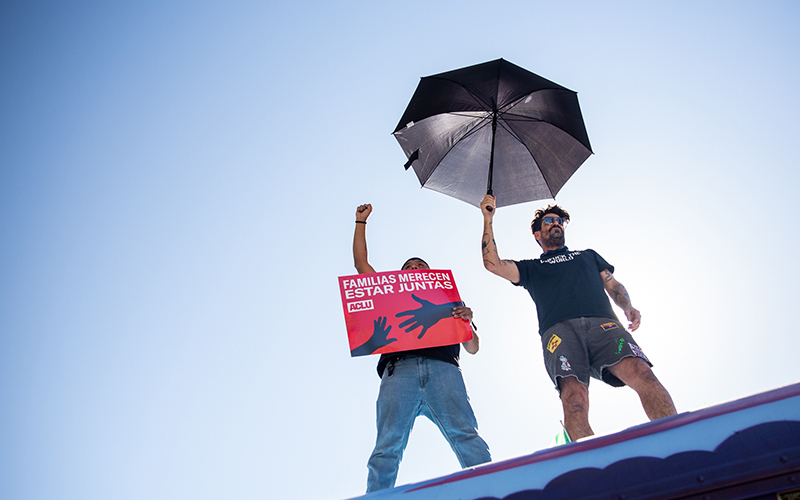 A large, colorful bus sat on the outskirts of the makeshift “stage” at the protest; spray-painted on the sides was the message “Let’s be better humans.” Two Roosevelt Row artists, Jon Linton and Jerome Mann, stood atop the bus with large signs, each with a fist in the air. Large speakers blasted “Heroes,” by David Bowie, and “Imagine,” by John Lennon. Linton and Mann are part of the I Have a Name Project, which began more than 10 years ago to put a human face on the homeless. The project’s bus is a common sight in the arts district. “We help the homeless and we go to a lot of protests,” Mann said. 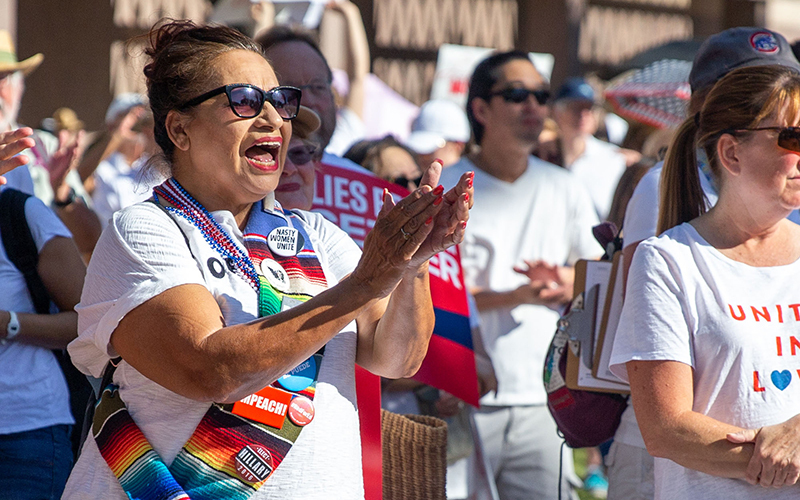 The Families Belong Together movement is co-sponsored by dozens of nonprofits across the nation, but the protests were mainly organized by Move On, a progressive nonprofit that focuses on the mobilization of progressive citizens for different types of advocacy. And advocacy was not to be missed. Multiple people milled through the crowd, gathering signatures for different ballot measures, including a measure to outlaw dark money in Arizona politics and another supporting the #RedForEd movement. All the while, organizers stressed the importance of voting. “Every single issue matters in the age of Trump,” said Antali Moore, 18, who was dressed in bell-bottoms and a custom-stitched shirt featuring a now iconic picture of Matt Damon. Her outfit matched the vibe of the mascot bus and was reminiscent of protests in the 1960s. As for the Trump administration’s zero-tolerance policy on illegal entry into the country and the separation of migrant children from their families, Moore was stunned but not mute.